The component, in forging process, is given shape by applying high localized compressive force. 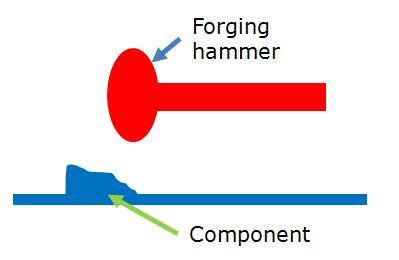 The application of compressive force can be of different types (like by dropping a hammer or by continuously pressing etc.) and necessarily with the presence of heat. The main advantage of this process is the high strength of the component due to the uniform grain flow. – Forging is skillful job. Ideal applications: Suitable for creating 3D components of the materials which remain ductile at forging temperature.